For the past three years, I’ve been cooking my way through Dorie Greenspan’s cookbook Around My French Table along with the rest of the French Fridays with Dorie crew. With hundreds of recipes in the book, one cannot love them all. Last week, I was intrigued yet uninspired by Floating Islands (meringues on a pool of custard). I was feeling the same ennui about this week’s recipe, but didn’t want to skip two weeks in a row. The selected recipe this week is Fresh Tuna, Mozzarella, and Basil Pizza. I like all the individual ingredients in this recipe, but I was having trouble imagining them all together in one dish. You never know until you try, so I plunged right in. The main ingredient in this one was fresh tuna. I’m a big sushi fan so I have no objection to eating raw fish, but I anticipated sourcing sushi-grade tuna to be challenging. There’s a Japanese grocery that sells sushi grade fish, but I didn’t have time to get there this week. I only needed a little bit of tuna because I was making just a single serving for lunch. My game plan was to buy some prepared sushi at Whole Foods and cannibalize slices off the top of a few rice balls. 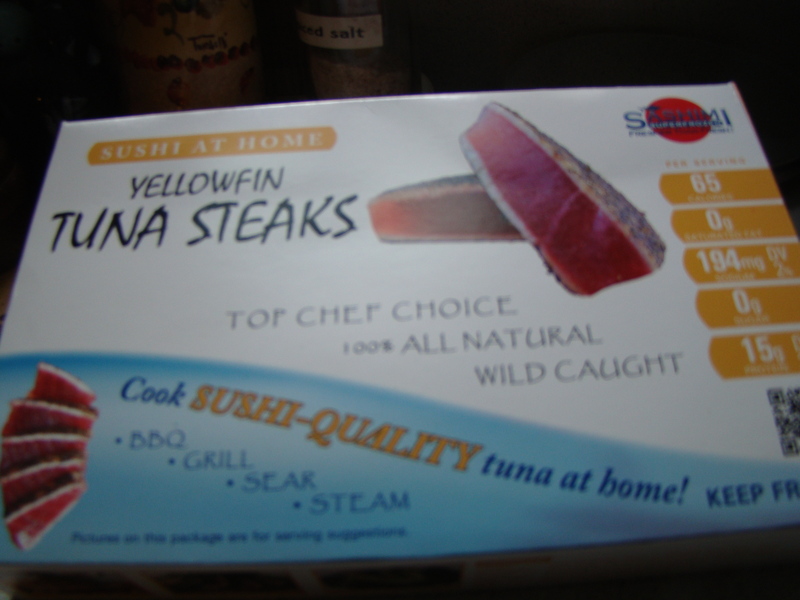 I was pleasantly surprised to find sushi-grade tuna in a freezer case in the fish department instead. The base for this fusion pizza is supposed to be a disk of puff pastry. I had a mini-tart crust hanging around my kitchen. When I made a tart last week, there was some extra pastry so I’d made a mini crust but hadn’t had a chance to fill it yet. This seemed the perfect opportunity to use it. With the crust and tuna ready, the rest of the preparation is a snap. Lightly sautéed scallions are spread on top of the crust. Then slices of tuna, fresh mozzarella, and basil leaves are alternated decoratively around the crust. 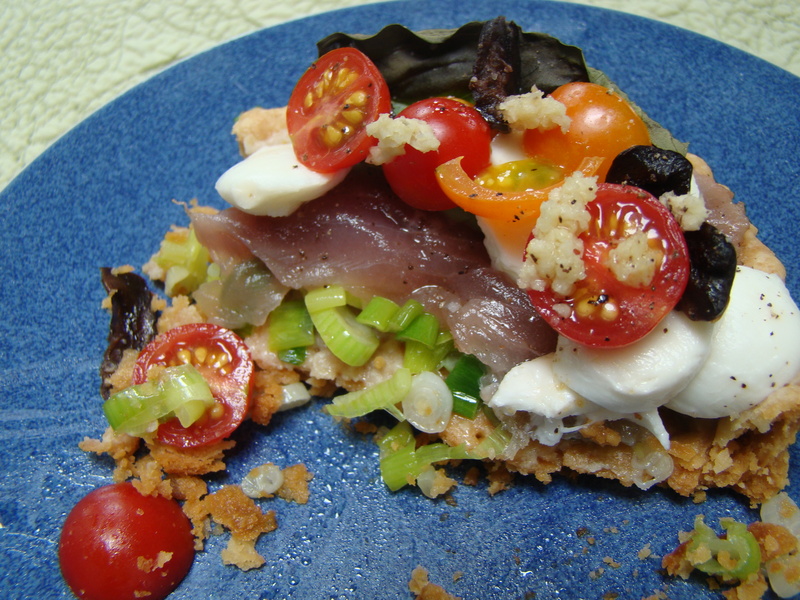 This would be enough for a beautiful tart, but then the tuna is topped with cherry tomatoes, olives, and freshly grated ginger. The tart is slipped into a hot oven for a few minutes to slightly cook the fish. 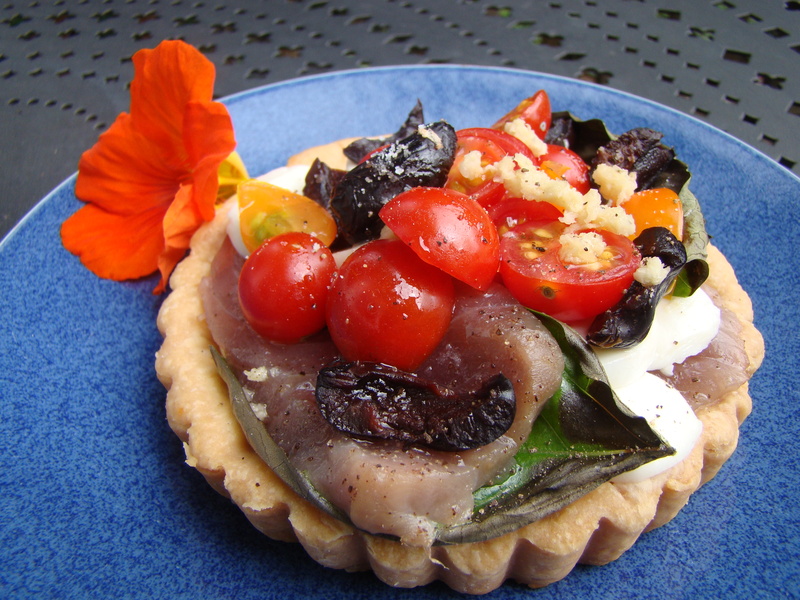 There’s no doubt that the fish tart was very pretty too look at. Unfortunately, I found the flavors a bit conflicting (or anachronistic, to quote my friend Lauren – you know who you are). On the one hand, the tuna and ginger are reminiscent of sushi. On the other hand, the tomato, mozzarella, and basil scream Salad Caprese. Sushi and Italian is a bit too fusion for me. My other complaint is the basil. After a couple minutes in the oven, any exposed edges turned black. I think this would work better to add the basil after it comes out of the oven. The concept works. I particularly liked the base of sautéed scallions. I wouldn’t rule out a second try that firmly stands in one flavor profile. While I didn’t try the puff pastry bases, I really liked this with the pâté brisée. I’m even inspired to make a batch of mini tart shells to play around. If you’re curious about how other Dorista pizzas turned out, follow their links here. Happy Friday!